Last night someone from Ohio followed a link from My Ecoach and became the 50,000 visitor to our blog. It has taken slightly less than two years to reach the milestone. 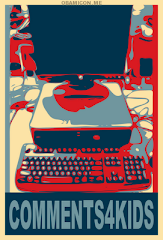 Thank you to everyone that has visited, linked to, or written comments on our blog. Video one from our faculty celebration for the Missouri Assessment Program. Adam Goldstein, a University of Alabama-Huntsville graduate student received an award for his work with the Gamma-ray Burst Monitor (GBM) instrument on NASA's Fermi Gamma-ray Space Telescope. On his first day as a volunteer, Adam was finishing his 12 hour shift when a gamma ray burst that lasted 23 minutes was recorded. To learn more of the story click this link to The Science Centric article. The reason why I am blogging this story is Adam is a graduate of McDonald County High School. His father, Scott Goldstein, has been keeping me informed what has been happening. In this article written by the McDonald County Press, Adam spoke about his dream is to become an astronaut. This ties in with our reading story this week, Interview with an Astronaut. I am hoping we have an opportunity in the future to interview Adam about his future plans. Then maybe we will have our own Interview with an Astronaut! 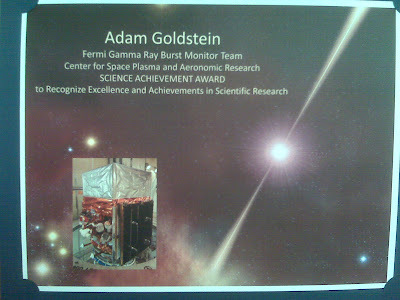 This is a picture of the award Adam and his team were given for their detection of the gamma ray burst. Are My Students Ready to Learn Without Me? This week my class was supposed to learn about the phases of the moon. 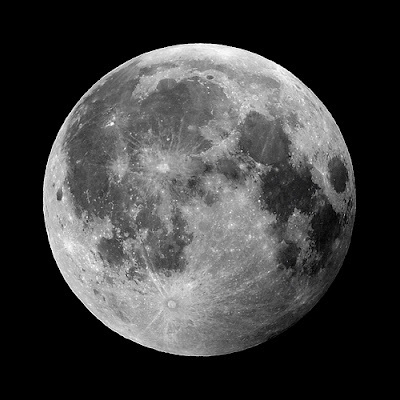 I knew they had very little experience with them, perhaps they could identify a full moon but not much else. I decided that this was a great opportunity for me to assess if my students were able to take information without direct instruction and use skills I have been teaching them all year to learn the eight phases. I briefly introduced the students to the eight phases and then gave them 2 links to do research. I told them that the I would assess them on the eight phases of the moon the next day and that they would have to be able to match the phases with their graphic representations (pictures). I gave the assessment on Tuesday, 3 students identified all eight phases correctly. Let me say that again 3 students out of 60 that took the assessment! I explained to the students I had conducted this assignment because I wanted to see if they could (or would) learn the material. Obviously, they didn't. After the explanation, I told the students they would be retaking the assessment Wednesday. We then discussed different strategies they could use to learn the material. Wednesday the students took the assessment again, and most of the students showed considerable improvement. Before they could start the assessment, they had to write what they did to prepare for the test. Many of the students chose to teach a member of their family the material, a strategy I encouraged on Tuesday. I don't believe they need direct instruction to learn, I think they are still more comfortable with that style of teaching. Even though I would love to think I have prepared my students to learn without me, I see that they just aren't ready. Art Interviews: Gavin asks,"Why did you draw that?" For our study of the phases of the moon I have chosen two sites to explore. Carefully follow all directions. Here is a link to the United States Naval Observatory Phases of the Moon and Percent of the Moon Illuminated page. Write the different phases of the moon and draw graphic representations of each. Here is a link to the University of Utah's ASPIRE site. Click the Lunar Phases link then follow the instructions. Follow the directions on the Lunar Phases page. Be prepared for an assessment on Tuesday on the eight phases identified on the first site. If you have been following the blog this week, you have been reading about our experimental reading assignments. Here is a visual representation of what we did this week. Here is Rosa and Natalia reading the story from the reading text on Tuesday. We had already read the story once in class, but the students had to read the story and take notes over the information. Rosa is listening to the story on the ipod. Here you can see Parker watching a video downloaded from Discovery Streaming. The video shows Robert Ballard's discovery of the wreck of the Titanic. Here is Rosa again recording the audio of her radio story. Notice the microphone placed next to the aquarium. I placed the microphone next to the aquarium so that it would record the sound of water running. I hoped this would lend some authenticity to the recordings. The rest of the recordings will be posted on the Novel Approach to Reading Blog next week when we have finished them. Mr. Howerton, our fourth grade history teacher, has graciously accepted the challenge of portraying Meriwether Lewis for our next reading assessment. We will be researching and preparing questions for an interview. The story we are reading is called "Talk With an Astronaut". Along with the interview questions the students will be using note taking skills and working on vocabulary skills. The assignments are addressed on the checklist. There are also links for the students to do research. Click here for this story's checklist. Student Reflections on This Weeks Reading Assignments. Here are three interviews I did with students. The topic is reflecting on the skills we used for studying vocabulary. Slendy talks about this weeks work. Amanda talks about what she learned from doing the skills. Meagan talks about how she learns vocabulary. Here is a short interview with Devin. We discuss his use of Power Point in class and his attitude toward using technology in the classroom. My reading class is trying to do something a little different this week. We are still using our Scott Foresman reading series and still doing the usual assignments. The difference is I have added an extra assessment and extra work to make that assessment successful. The story we are reading this week is about Robert Ballard and his discovery of the Titanic. The extra assessment is for my students to write a radio report that they will present on Friday. They are going to pretend to be a reporter and give a live radio broadcast as if they are on the Titanic when it sinks, or with Robert Ballard when he discovers the Titanic. For research they have watched a video, read some articles, and, of course, read the story in the reading book. 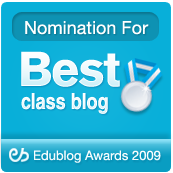 Click here to see the checklist I created for my students to follow. As you can see, the students had to use several skills to complete this assignment. Today they are reflecting on which skill will help them most with their reading assessment tomorrow. Tomorrow they will analyze their reflection. 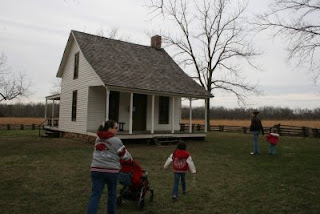 These are pictures from George Washington Carver National Monument in Diamond, Missouri. My family visited Friday since we were out of school. This is the first time in about five years that I have visited and since the last visit there has been a huge remodel and upgrade of the facility. They have added many interactive places for kids and adults to explore using scientific equipment. The focus of the interactive exhibits is on nature and farming, both of which Carver loved to learn about. Overall, I felt there were two main points of emphasis that is evidenced at the park. The first is that Carver was a deeply religious man who relied heavily on God to inspire his work. There are numerous quotes by Carver giving God credit for his guidance and it also includes Carver explaining his conversion experience. The second point of emphasis at the park was with Carver explaining that the most important focus for mankind is to do service for others. He explained that he never patented any of his creations because he did not want the benefits to be felt by only a few people. Two of the most impressive features of the building are the classroom and the laboratory. 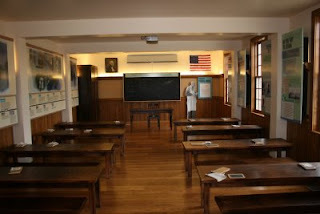 The clasroom is set up like a classroom form a one room school house. It includes tables with benches and slates for the students to use. The laboratory contained lab tables and equipment that are obviously used by school children in programs provided at the monument. As a teacher these two rooms are both intriguing and inviting. Outside the main building is a walking path that takes you through the park. There are four separate areas on the walk that are very interesting. The first is boardwalk over a wetlands area. The boardwalk allows you to cross the stream running through the park and lets you look at the plants and animals present. The second area is a small pond that has a trail around it. It is a quiet spot that is intended for reflection and perhaps quiet prayer. The third area is a recreation of the Moses Carver house. There are often reenactors here showing how life was like in the 1850's. I have seen soap making, doll making, and farming demonstrations here during various visits. The last area is my favorite. 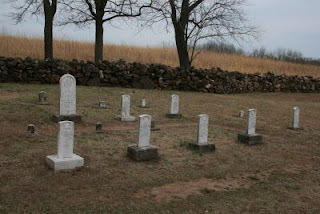 It is the Carver family cemetery. When you look at the tombstones and read the dates you will quickly realize that the cemetery is filled with the graves of young children. This is a powerful lesson in how hard life was for children 150 years ago. It is a place to give thanks for the amazing advances in medicine that have taken place since then. Overall, this park is one of the best, most updated parks my family and I have been to in the last five years. I highly recommend you look up the park if you are in the area. Our school had a fantastic assembly Thursday! We had three reenactors, Ted and Sandy Spring and Rusty Hicks, come to do a giant Viking show-and-tell. They brought an immense number of artifacts as well as an incredible amount of knowledge of their subject. Here are some pictures we took and a video of the presentation. I asked for a list of different presentations they do in schools.Here is what Ted sent me. Rusty does an escaped Scots White settler of 1759 on NY frontier during the French and Indian War era and a Highlander during the Scots war of 1740's.He also does a white born-NE woodland raised native American of 1743. Together we do two men in ROGERS RANGERS in NY in Nov.of 1759 after the St.Francis raid. I do a German soldier and paratroop jumper of 1944 France and an SS sniper 1945 Berlin defence Volks Heer. I do a 101st Airborne Sgt. in France during the Hedge Row fighting in early summer of 1944 just after the Normandy jump. All these stints, so to say, have many proper historical props involved and on display. The cost of the presentations depends on the distance traveled and and number of presentations they do. If you would like to contact the reenactors you can email Ted Spring at tedspring@yahoo.com. Here are the long awaited responses to Mr. Webb's students' questions. Please keep in mind my students did not receive help answering the questions, these are their real answers. Nathan is going to answer the questions from Prshant. Seth is going to answer the questions from Scott. Saul is going to answer the questions from Kaiya. Sergio is going to answer the questions from Bradyn. Kayla is going to answer the questions from Baily. Gavin is going to answer the questions from Arahia. Here is the class discussion we had about the story The Three Century Woman. This does not include specific skill and comprehension questions. Instead the goal was to help the students make connections between the story and what they already know. Thinking Things from Snaith Primary is an excellent source for all types of interesting things. Our students will be visiting this site today to look at the Vikings information. We have special visitors coming tomorrow! I plan on recording their presentation, but I am not sure that I will be able to stream video of it. I will send out a twitter if I am able to show the presentation live. Rachel is a student at the Shanghai American School in China. She has been gracious enough to comment many times on my blog as well as occasionally chatting with me online. Rachel left a comment last week asking for me to come check out the video her brother made which she posted on her blog. Here is a link to the excellent video. If you are interested in creating movies or would like an example of a student's work, then you need to watch it! 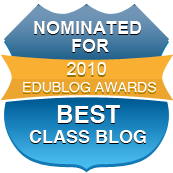 Thank you, Rachel for your support of our class blog. Not a Replacement, but Close Enough! This is a public service announcement that ran on Australian television. The responsibility that we accept when we drive a car is immense. Don't drink and drive. Here is a slideshare presentation we will use in class to help my students understand how and why they should make good design choices when using any presentation software. Here are sculptures my students made as an assessment in Art class. We were in the process of recording the stories they had written about the first Stanley Yelnat's encounter with Kissin' Kate Barlow. When we went into the art room the art teacher informed the class they would be assessed on a sculpture they were to create. I suggested they use something from the story Holes. Here is what they came up with. New Zealand Pt. England Primary was featured on television last week. Not on our local television, not even on our national channels. Pt. England was featured on television in New Zealand. 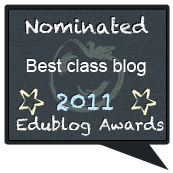 The reason why I am blogging about it is we follow Mrs. She's class blog Little Voices, Little Scholars. The news story talks about how they use technology in their school. This school should be a model for our schools in the United States. Here is a link to the video of the story. During our live streaming of career day, I was back channeling through Twitter. One of the people that came to watch the video on the blog was Piers, age eight, who lives in New Zealand. 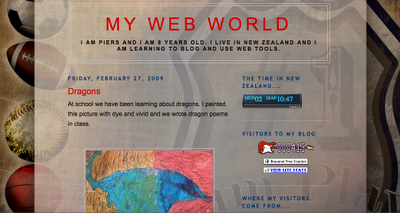 Piers has a blog, My Web World, which I discovered through Mr. Webb's new blog Room 8 @ Melville Intermediate School. If you remember, Mr. Webb was the teacher we created the Samoan Slap Dance for last October. We are very fortunate to have these friends to share our experiences with. The fact that they are 8,000 miles away no longer makes a difference!